Starbucks Corp. (SBUX.O) is expanding its venture with Uber Eats, offering delivery in San Francisco followed by expansion into other major U.S. cities and rolling out a new test program in London. 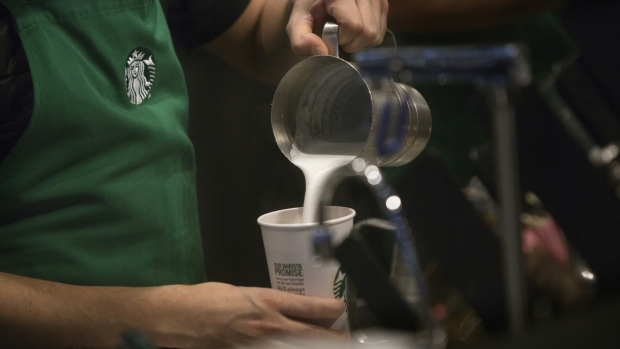 The service will start in San Francisco on Tuesday, to be followed by Boston, Chicago, Los Angeles, New York and Washington D.C. “in the coming weeks.” Starbucks is planning to bring delivery service to nearly a quarter of U.S.-owned stores in seven cities this spring, the company said in a statement Tuesday. The announcement builds on a trial run that started in September in Miami. Almost all of Starbucks’ menu items will be available with delivery times of within 30 minutes -- and an initial $2.49 booking fee. The coffee chain is planning to test delivery programs in other countries this year, with London being the first European city targeted for a pilot later this month.